Thursday will bring some brief changes to what has been a stagnant weather pattern. 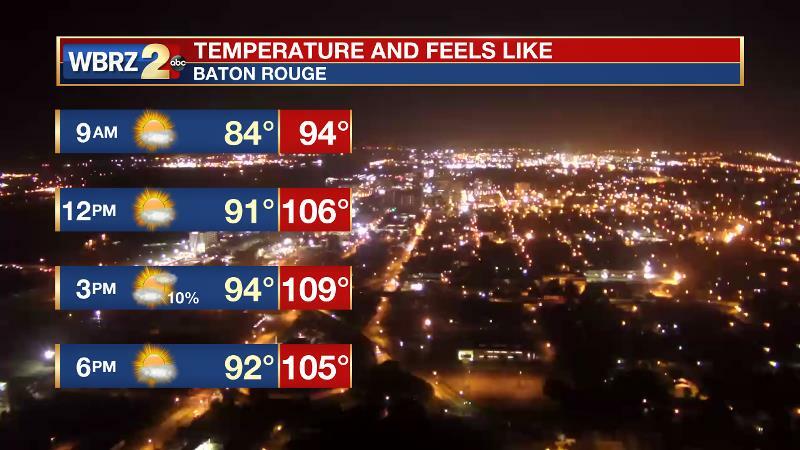 A *HEAT ADVISORY* is in effect for the entire WBRZ Weather forecast area until 7pm Thursday. This means the combination of heat and humidity could produce feels like temperatures of 108 degrees or higher for three or more hours. 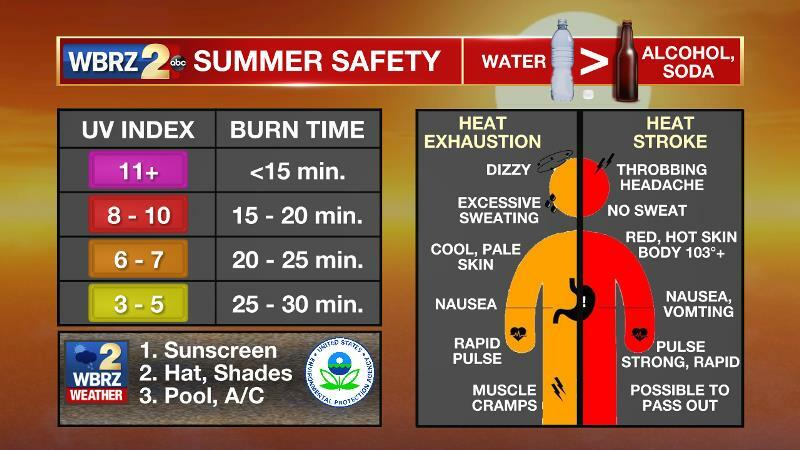 Though we have had hotter days in the past, this will be some of the most oppressive heat so far this summer, so remember to hydrate thoroughly and take it easy if you will be spending considerable time outside. Today and Tonight: Much lower rain coverage will mean more locations can cook for a longer period. High temperatures will climb into the mid 90s and stay there. With ample August humidity, feels like temperatures will be over 105 degrees for several hours during the middle of the day. Now, if a stray storm can fire up, it could quickly turn strong given all of the heat energy available. Tonight will stay mild and muggy with low temperatures in the upper 70s. Up Next: On Friday, showers and thunderstorms will begin to ramp up again. However, different from earlier this week, gusty winds will be possible in addition to downpours. At this point, it looks as though the bulk of the action will remain north of I-10. Then, the upcoming weekend looks unsettled with widespread showers and thunderstorms during the afternoons. Therefore, high temperatures will return to 2-4 degrees below average. Into next week, the pattern should become a bit more typical with highs in the low 90s, lows in the mid 70s and isolated afternoon showers and thunderstorms. 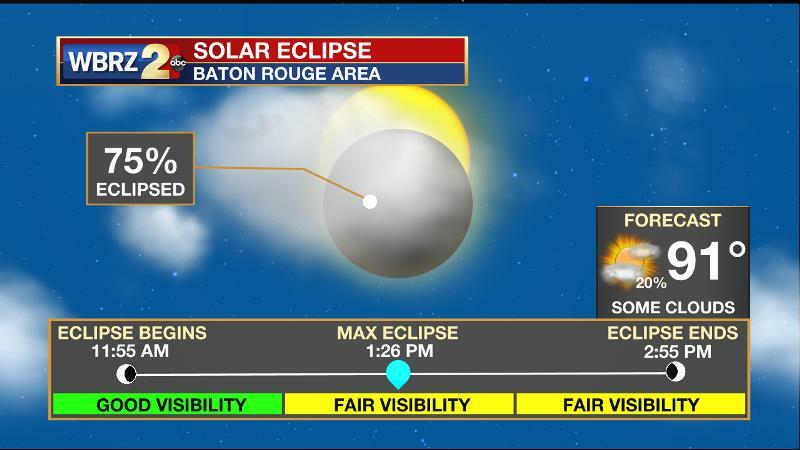 At this time, we stand a decent chance of seeing the solar eclipse on Monday. Like any August afternoon though, there will be a growing cloud deck and isolated showers are in the forecast. CLICK HERE for much more on the solar eclipse. The Tropics: Hurricane Gert is a category two storm in the open north Atlantic. Packing 100mph winds, the storm will continue to accelerate northeastward and out to sea, quickly degenerating over the next day or so. 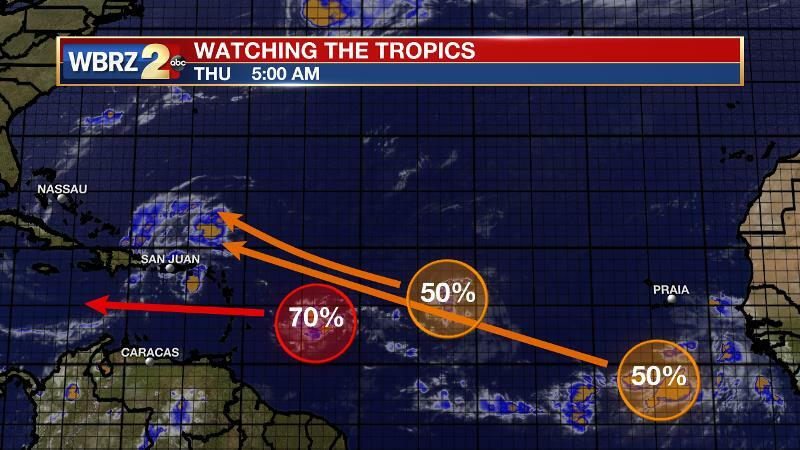 Three other waves are being monitored in the eastern Atlantic. Between the Lesser Antilles and the Cabo Verde Islands, all have better than a 50 percent chance of further development over the next five days. This is the time of year where we will need to keep an eye on just about any wave rolling off of the African Coast. As a low to mid level ridge digs into the area Thursday with strong capping, there should be very few, if any, showers and thunderstorms that are capable of developing. However, especially for Baton Rouge and points west, if a thunderstorm is able to get going, the potential would be heightened to produce gusty wind and heavy rain with a lot of energy available. Actually, the main weather issue Thursday will be heat as cloud cover and rain will be at a minimum. Heat index values could reach 108 degrees or higher during the peak heat of the day. This would normally not be too much of a worry if conditions had been this hot already, but this will seem like a sudden onset of hot conditions that could prove to be an issue with outdoor activities. Friday, we will see the mid level trough move southward again with deep moisture. Where this moisture interacts with the aforementioned drier air, some stronger storms will again be possible. Most activity should be found over the northern half of the forecast area on Friday. Once the deep moisture fully moves back into the area, we will shift from possible severe storms to heavy rain again and the heat will settle to what we have been used to. Saturday looks to be quite wet but Sunday looks to be the wettest of the weekend. Most thunderstorms over the weekend will be back-building and this could lead to some flooding of streets and low lying areas. Deep moisture sticks around much of next week keeping the chance of rain at or just above average. Daily coverage will be dependent on the depth of a mid level ridge that forecast models are once again showing across the Gulf Coast.